Have your kids unplug with mud and discover the mindfulness benefits of working with clay at Clay Art Center’s award winning weekly themed half & full-day SUMMER CAMPS for children & teens ages 6 – 15. Discover the Art of Summer - Make Friends, Memories and Art! 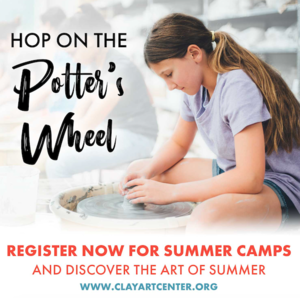 Clay Art Center offers week long, half-day and full-day clay camps for children and teens ages 6 to 15 from July 1 – August 28. Weekly themes include "Selfies, Emojis and Memes”, "Comics in Clay", “Amazing Animals”, “Bubble Bowls”, "Re-Invent the Wheel" and many more. In the classroom, aspiring young artists will develop their imaginations and build confidence, while working in the transformational medium of clay. Our nurturing teachers, who specialize in kindling a passion for creative expression in children, know how to make our camps special by creating an atmosphere of learning, fun and friendship. Focusing on wheel throwing, hand-building and sculpture, campers will be shown a variety of techniques on and off the wheel. In today’s technology driven world your child will discover the satisfaction of creating something with their own hands. They will craft everything from fantastic beasts, fairies and castles to handmade cups, bowls and plates that your family will treasure forever. Port Chester Discount – 20% off for Port Chester Public School Students. Clay Art Center is a nationally recognized non-profit center for the advancement and practice of ceramic arts offering exhibitions, clay classes for adults and children, studio spaces for clay artists and outreach programs in the community. It is located in the heart of Port Chester at 40 Beech Street, Port Chester, NY 10573. Gallery and SHOP hours are Monday - Saturday, 10am-5pm or by appointment. Tel: 914-937-2047 www.clayartcenter.org.